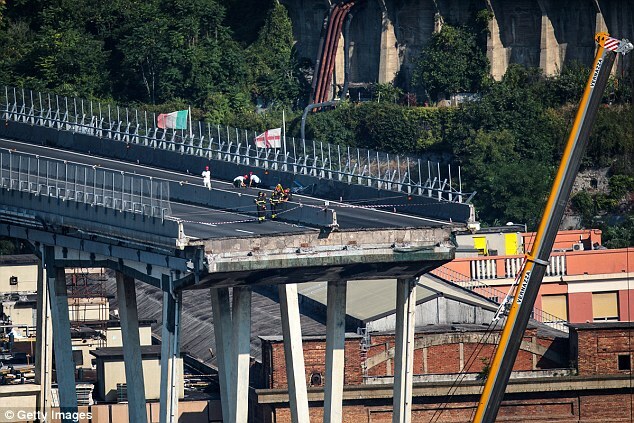 This is the dramatic moment the Genoa highway bridge, which collapsed last week killing 43 people, comes crashing down onto the streets below. 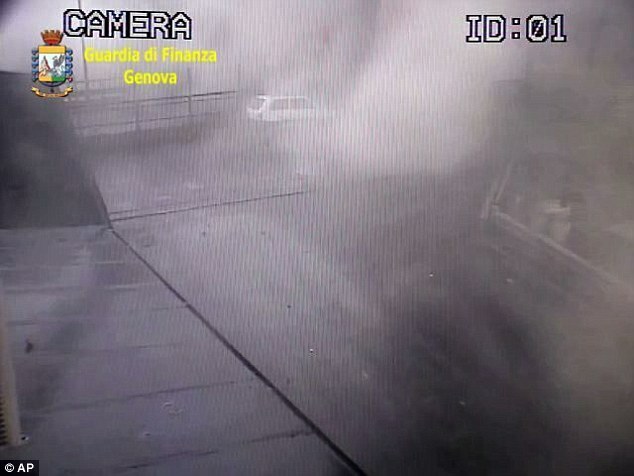 CCTV footage shows concrete blocks and debris falling onto the roads, just seconds after a man is seen walking in the same spot, filling the screen with white dust. It has been released as it is revealed that experts warned months ago that the corrosion of the metal cables supporting the bridge had reduced its strength by 20 per cent - yet local authorities did nothing to limit traffic or warn the public. 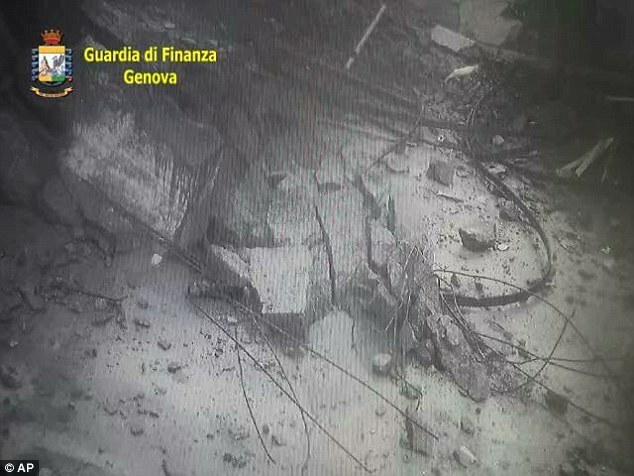 And investigation and the results came in February - six months before the collapse last week, Italian newsmagazine Espresso reported Monday. Despite the findings, 'neither the ministry, nor the highway company, ever considered it necessary to limit traffic, divert heavy trucks, reduce the roadway from two to one lanes or reduce the speed' of vehicles on the key artery for the northern port city. 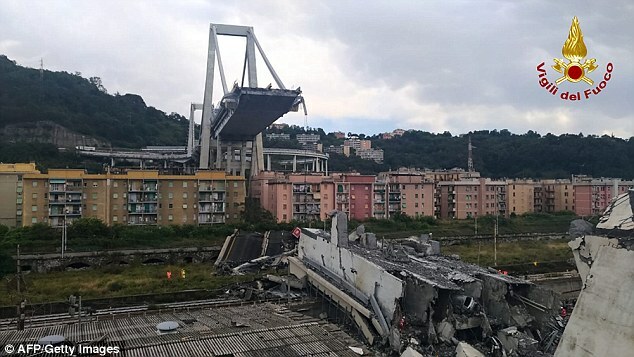 A large section of the Morandi Bridge collapsed August 14 during a heavy downpour, killing 43 people and forcing the evacuation of more than 600 people living in apartment buildings beneath another section of the bridge. 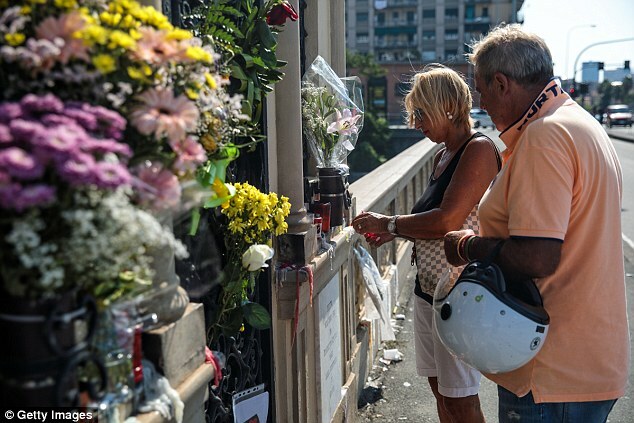 Former Transport Minister Graziano Delrio told a news conference Monday that 'no one ever signalled the necessity of limiting traffic' on the bridge. 'Everyone was well aware of the situation on that bridge,' Gatti said. 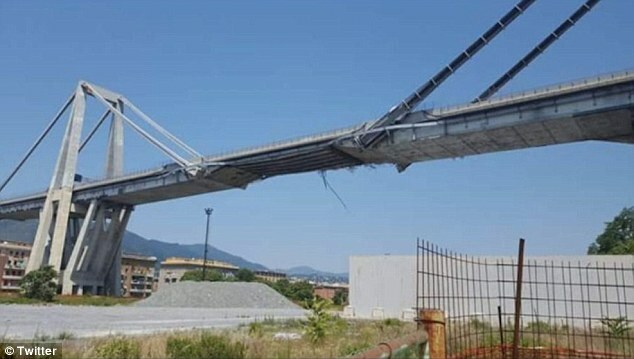 Bidding on a 20-million-euro (£18million) contract to reinforce two of the major supports for the bridge, including one that collapsed, was scheduled to close next month. 'Think of all the revenues that would return to the government through tolls, to use not to donate to shareholders' dividends but to reinforce the quality of service and security on our roadways,' Toninelli was quoted as saying. 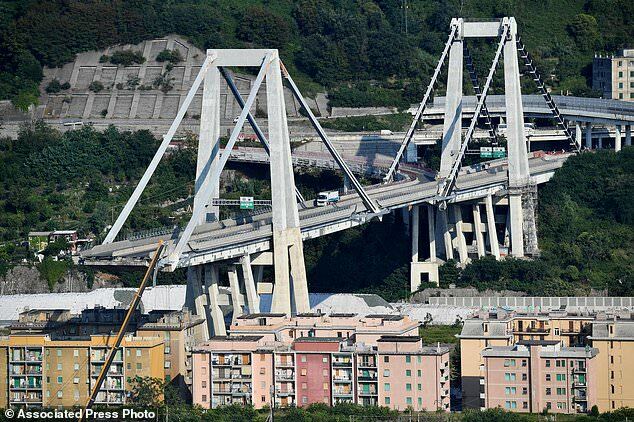 Italy's main union confederation estimates it would cost Italy between 15 billion and 18 billion euros (£13.4billion to £20 billion) to revoke the highway rights.